In January we had a day off from caring for Dad. It was a stinking hot day (41 degrees) and coming out of the air-conditioned comfort of Cinema Nova, we weren’t quite ready to head home yet but didn’t want to relinquish our undercover car park. What could we do? Then I remembered the Museo Italiana at the CoAsIt building in Faraday Street, which I’d promised myself I’d visit one day. Was it open? Yes! open Tuesday to Saturday. Was it air-conditioned? Yes! Beautifully! It’s a good little museum, documenting the Italian migrant experience right back to convict days and the gold rush, but focussing on post-war migration. During the 1950s and 1960s, Carlton was known as the Italian part of Melbourne, a small remnant of which remains in Lygon Street today. The displays are professionally mounted, and there’s good use of music and video. And if you need any further encouragement- it’s free! There’s a fantastic exhibition on display at Bundoora Homestead called “Coming Home” that commemorates the use of the homestead as a convalescent farm and repatriation mental hospital between 1920 and 1993. Even though it’s ostensibly an exhibition about the use of a house, it’s a sad and very human exhibition. There are none of the brass bands and official ceremonies that we saw last week at Albany , but this exhibition is an act of commemoration nonetheless. As I’ve written about previously, (here and here) Bundoora Homestead was built in 1899 by the Smith racing family as their residence and stud farm. In 1920, immediately in the wake of WWI the Commonwealth government negotiated the purchase of Bundoora Park estate as a convalescent farm for returned soldiers from the WWI front. As Marina Larsson wrote in her book, Shattered Anzacs (review), the families of returned servicemen with mental illness were keen that their loved ones not been seen as ordinary ‘lunatics’, but housed and treated in repatriation facilities in recognition of their war service. Bundoora Repatriation Mental Hospital was sited across the road from Mont Park as a separate, soldiers-only hospital that could draw on the facilities of the civilian asylum nearby. The exhibition focuses on individual men, most particularly Wilfred Collinson and Harry ‘Lofty’ Cannon, who spent decades of their lives at Bundoora. Wilfred Collinson was a British migrant, who arrived in Australian in 1914. He hadn’t been here long, working as a farm labourer with a friend that he’d met on the ship over, before the two lads volunteered and were returned to Europe to fight in WWI. He had a long war, and was gassed four times. On his return to Australia he and his friend, Eric Brymer, boarded in South Melbourne, and Wilfred soon married the girl next door and embarked on a family life. His children grew up with a father affected by “nerves” who became increasingly delusional, and eventually he was committed to Bundoora in the 1930s. As Larsson points out, families often had to battle the government for pensions and recognition that illnesses and injuries were war-based, and Wilfred Collinson’s wife is a case in point. His friend Eric Brymer, who was the only person who could testify to what Wilfred had been like before the war, wrote a letter in support of his wife’s application on her husband’s behalf. Then followed another thirty-five years, and two generations, as his wife and daughter, then daughter and his granddaughter, went out to visit ‘Dad’ at Bundoora. He died there in 1972. His war, in effect, was never over. 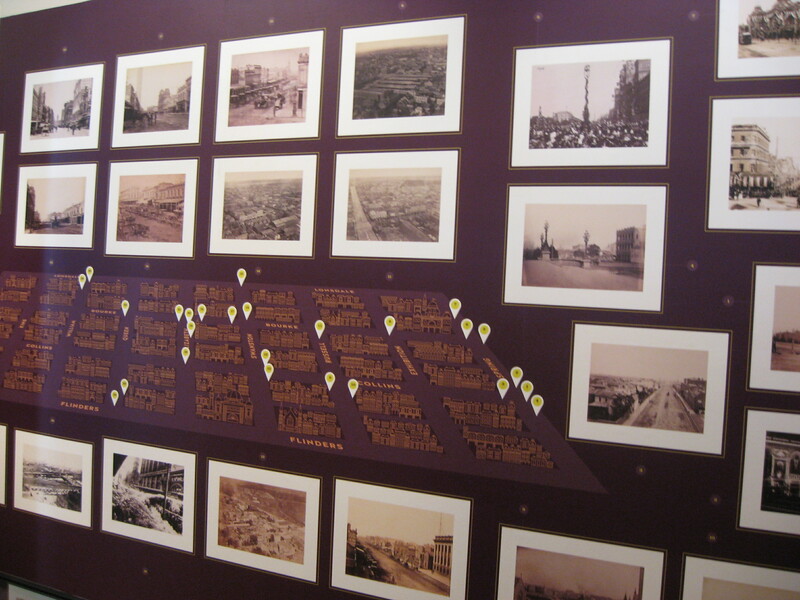 (You can see the video of his daughter and granddaughter on the exhibition site here. The video is also running at the exhibition). Harry ‘Lofty’ Cannon was a medical orderly with the 2/9 Field Ambulance and Changi POW. We’ve all heard about Weary Dunlop, but I’d not heard of Lofty Cannon. He was a tall man- 6 foot six- but it was a shrunken life that he returned to after WWII. He’d married just six days before leaving for the front, he fought in the Malay campaign and was captured as a prisoner of war in 1942. While he was at Changi he met Ronald Searle, an English prisoner-of-war, who later credited Lofty with saving his life, nursing him through beri-beri and malaria. Lofty wasn’t in much better shape, with ulcers, malaria and dysentery and the after-effects of beatings from the Japanese guards. He was hospitalized at the Repat. in Heidelberg in 1946 on his return to Australia, where he received ECT and insulin coma therapy. By 1947 he and his wife were living on a soldier-settlement farm near Swan Hill but by 1960 his wife and adopted son returned to Melbourne and Lofty went to Bundoora. From Bundoora he wrote letters to his wartime friend, Ronald Searle in England, by now a noted artist and illustrator, probably best known for his St Trinian’s illustrations. Much of the display shows Searle’s sketches that he made of Changi, several featuring Lofty. These are in the possession of the State Library of Victoria, and you can see them online if you search slv.vic.gov.au for “Cannon, Harry (Lofty)”. He died in 1980 at Bundoora. Rachael Buchanan wrote a terrific essay about him in Griffith Review 2007 freely available here. Bundoora Homestead is beautifully restored and such a peaceful place today that it’s hard to believe that so much sadness seeped through its walls and the now-demolished wards that once surrounded it. The exhibition runs until 7 December at Bundoora Homestead Art Centre, 7-27 Snake Gully Drive Bundoora, Wed-Friday 11.00-4.00 p.m and Sat and Sun 12.00-5 p.m.
My youngest child is walking her feet off for the Oxfam 100km Trailwalker today. And was I there to support her? Why, no – I was off into town to catch one exhibition before it closes and to see two others that I’ve promised myself I must see. I’ll do supportive mother tomorrow. 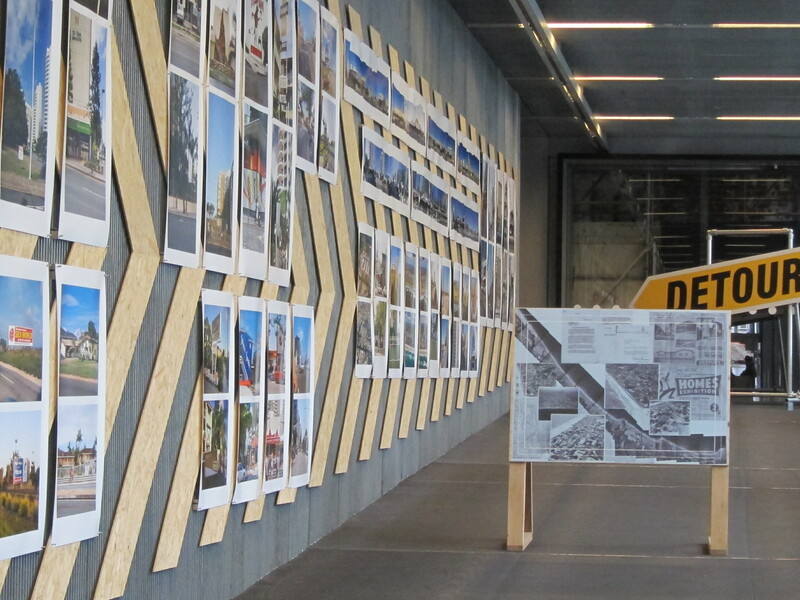 The first exhibition, which closed today, was ‘Learning from Surfers Paradise’ which was displayed in the lobby to RMIT’s Design Hub at 100 Swanston Street (corner of Victoria Street). Architectural photographer John Gollings, along with three others, arrived in Surfers Paradise in 1973 to undertake a project photographing Surfers Paradise. Forty years later he returned and took the same photographs again from the same spot. So what do we learn? Many of the buildings in 1973 that had been cutting edge in the 1950s and 1960s were looking a little tatty by then. There’s a sameness about many of the buildings that have replaced them. Certainly there is more greenery in the streets. Some buildings from the 1950s and 1960s quite frankly were no loss at all. Others, however, were a loss- especially the Surfers Paradise Hotel which had such a distinctive outline and was replaced by a very ordinary entrance to a shopping centre. We used to holiday up there from about 1975 onwards, so many of the places were very familiar. There were a couple of places in the recent photographs that I recognized that are still there. 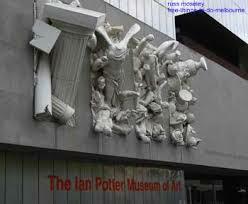 Then off to the Ian Potter Museum at the University of Melbourne. They have an exhibition ‘Secret Lives, Forgotten Stories: highlights from Heritage Victoria’s Archaeological Collection’. I was attracted to this exhibition (which is on until 12 October) because it has artefacts that were collected from excavations at Viewbank Homestead. Viewbank, which was demolished in the 1920s, was situated close to Banyule Homestead, and there was a close association between the two houses through Robert Martin and his family. There have been several digs at Viewbank which have uncovered pottery, crockery, toys, bottles etc. One rather amazing find: a cup with ‘Robert’ written on it. All of a sudden, these jagged shards of crockery seemed very personal. 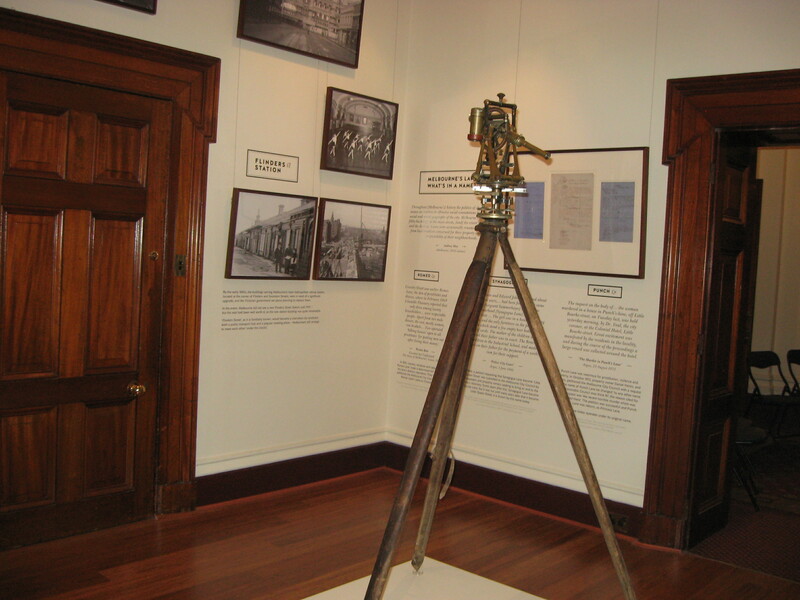 Most of the material came from Viewbank, but there are other archaelogical digs featured as well: the coffins shifted from the Old Melbourne Jail to Pentridge that included Ned Kelly’s bones; Cohen place near the Little Lonsdale Street excavation; the Eureka lead; a Chinese brick kiln from Bendigo; the Sorrento settlement, and two shipwrecks. 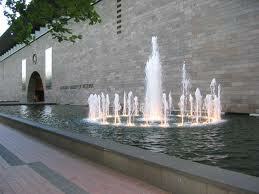 Finally off to the NGV for their Blake exhibition. Plenty of time to see this one too- it closes 31 August. Did you know that Melbourne has the largest share of the 102 watercolours created by Blake to illustrate Dante’s Divine Comedy? They were purchased in 1918 by a consortium arranged by Robbie Ross (Oscar Wilde’s close friend) that comprised the National Gallery of Victoria, The British Museum, the Tate Gallery, Birmingham Museum and Art Gallery, the Ashmolean Museum at Oxford and two private collectors. The watercolours were to be sold as a set and there was much anxiety that they remain ‘within the Empire’. 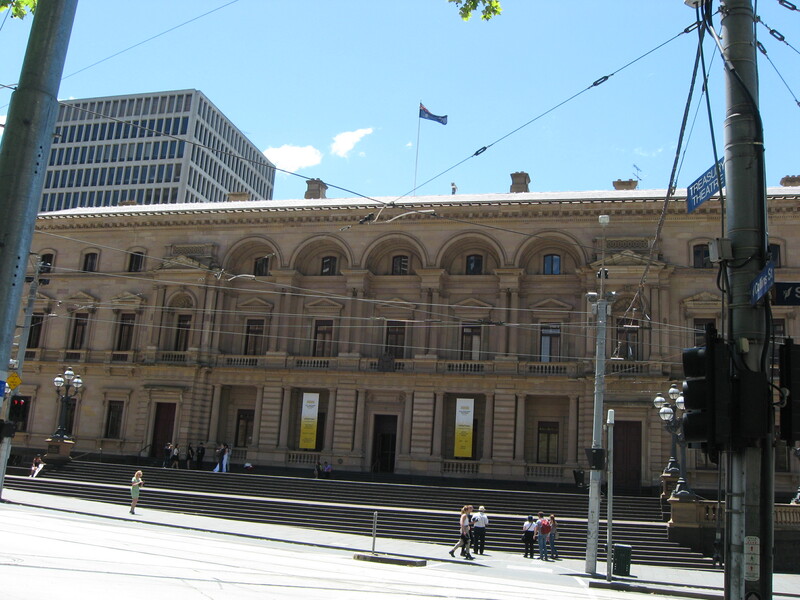 The National Gallery of Victoria was a major player amongst these illustrious organizations because it had been recently enriched by the Felton Bequest. The prosperous Melbourne businessman Alfred Felton had left 383,000 pounds as an investment fund, with the earned income to be divided equally between nominated charitable causes and the NGV for purchases of art. So, all of a sudden the little art gallery from the bottom of the globe, with all its wealth, was welcomed with open arms. Dividing up the set was conducted through a carefully pre-arranged system, whereby the watercolours were divided into three categories depending on how finished they were (because some were still very rudimentary sketches). Depending on their contribution, each consortium member could select in turn from the three categories in a round-robin arrangement. National Gallery Victoria and the Tate each ended up with 36, the British and Birmingham museums six and the Ashmolean and private collectors three each. Despite the plan to keep them within the empire, twenty three ended up at the Fogg Museum at Harvard University. Melbourne’s thirty-six are on display in a large darkened room on the ground floor. In fact, you can see them all here on your computer but they’re much, much better in real life. There is also a digital display of the whole 102 watercolours at the exhibition, along with a brief description and explanation of the scenes from the Divine Comedy that they are illustrating. I felt a little guilty looking at the digital version while the real thing was hanging just a few metres away, but I really didn’t know much about the Divine Comedy, and I appreciated them more having seen the whole collection. I find it amazing that Blake was working in the early decades of the nineteenth century: they are striking pictures. All these exhibitions were free. How blessed we are. Along with a good coffee or two, a tasty lunch while resting our feet, it’s been a lovely day. Speaking of resting one’s feet, I wonder how that daughter’s getting on…. 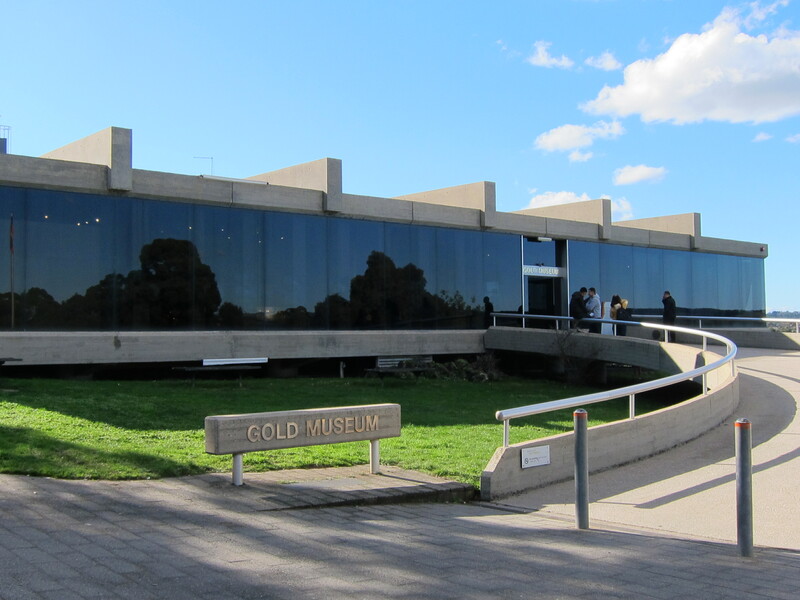 The final stop on our weekend in Ballarat was the Gold Museum that is adjacent to Sovereign Hill. It’s been there for some time- in fact, it even has a statue of Sir Henry Bolte out the front, welcoming his contribution to the creation of the Sovereign Hill/Gold Museum precinct. I suppose that there’s a long tradition of commemorating patrons with a statue. The Gold Museum had always seemed a rather strange place to me. I remember it having many displays of gold coins and nuggets which have never particularly interested me. I’m not sure whether they’re authentic or reproductions: I suspect the latter because there seemed to be little overt security presence. As a display, it seemed even more disjointed this time around and rather tired. However, this was only part of the display, and the rest was excellent. There was a rather dimly lit exhibition about gold and its impact on Victoria generally, and Ballarat in particular, and it was very well done. We spent probably 45 minutes looking at a panorama of Ballarat taken by William Bardwell from the top of the town hall spire in 1872. (See here for just one of the 15 images) I assume that the photographs had been taken in the early morning because there are not many people about and the clarity, especially for a photograph of its age, is amazing. We spent ages picking out buildings we knew, contemplating the variety of industry and civic life depicted, transportation etc– very well done indeed. A temporary display highlights letters of the goldfields, and in particular the Petford Letters Collection. This is a series of 36 letters written by James Petford who arrived in Adelaide in 1848 then travelled between goldfields in Victoria. It’s sobering to see how tenuous the communication links could become between family members with letters waiting literally years before being collected, and vain attempts to keep some sort of chronology intact with marriages occurring and breaking down, children being born and dying and people moving on. We had been lured up to the museum by the Anne Frank travelling exhibition which had closed in Melbourne before I got to see it. No doubt, those who have seen the Anne Frank house itself would sniff at this travelling exhibition but given that I’m not in Amsterdam…. There was a good video, then a pictorial display based on a timeline. All very apposite, given that last week was Refugee Week. I’d like to think that I would have had the courage to help had I been in the situation, but I fear that I wouldn’t. Life was so cheap. I hadn’t realized how close to liberation Anne Frank’s death was, and I continue to be impressed, especially when I hear readings of her diary entries, by how well she wrote. And so, completely museum-ed out we headed for home. Where next, I wonder, within 100 km of Melbourne?